The world’s largest airport is open for business and DMD Turkey is the go-to provider for a wide range of print and digital media services to airlines operating there. The new Istanbul Airport stands at the centre of an extensive flight network as one of the most important hubs in the world. The first phase terminal hosts an annual capacity of 90 million passengers and when complete the airport will service over 300 destinations with an amazing 200 million capacity. As a world leading travel media provider, DMD works with airlines and other travel operators globally to give them premium access to the very best printed publications and digital content. To find out more about how DMD Turkey can help you offer your passengers a bespoke range of superb newspapers, magazines and digital titles at this fantastic new airport contact our Istanbul office today. Raunheim, Germany | February 26, 2019– Displaying one’s own aircraft position on airport maps helps pilots navigate between the gate and the runway. This function in the Lido/AMM Airport Moving Map from Lufthansa Systems can now be combined with the external Bluetooth GPS receiver from Bad Elf. This GPS is easy to install on the flight deck and considerably cheaper than using GPS information from conventional avionics systems. The small Bad Elf GPS devices accurately show the own-ship position on the airport map. This helps pilots, especially when navigating unfamiliar airports, and improves their situational awareness. Taken together, the navigation applications from Lufthansa Systems have thus far supported the following aircraft interface devices (AIDs) for integrating GPS information: the AID from Boeing ONS, the UTC Aerospace Systems Tablet Interface Module® (UTAS TIM) and GroundLink AID+ from Teledyne. Other cheaper GPS solutions, by contrast, are often not precise enough for use at airports. This new cooperation with Bad Elf led to the solution: a portable, external GPS device that is smaller than a conventional smartphone and can be simply certified for use on the flight deck. The Bad Elf GPS connects to the digital maps either via Bluetooth or cable, and no further installation is necessary. The new function has already been integrated into Lido/mPilot for iOS and Lido/eRouteManual for Windows. All that an airline needs to use it is the Bad Elf GPS Pro+ accessory. Richmond, B.C. | February 13, 2019–Today, Vancouver International Airport (YVR) released final passenger numbers for 2018, confirming another year of record-breaking growth. YVR welcomed more than 25.9 million passengers, a 7.3 per cent increase over 2017, reaching its 25 million passenger milestone two years ahead of forecast. October 18, 2018– Oriens Aviation, the exclusive British Isles Pilatus Centre and sales distributor for the PC-12, and London Biggin Hill Airport were pleased to welcome Jetfly’s Pilatus PC-24 (LX-PCA) on 18th October, as part of the fractional operator’s European tour. The Luxembourg-based operator, European launch customer of the PC-24, flew in the first of its four newly-accepted versatile light jets, plus one of its 22 Pilatus PC-12NGs, to showcase to a private audience gathered at Oriens Aviation’s new maintenance base. Its London Biggin Hill showing followed appearances of the aircraft at Geneva’s Annemasse Airport and Toussus Le Noble Airport in Paris. “Oriens Aviation offers an extensive maintenance facility at Biggin Hill, so its smart hangar was the perfect backdrop to showcase our amazing, one month-old Super Versatile Jet in the UK,” said Jetfly CEO Cédric Lescop. Jonathan Clough, Jetfly Sales Director for the UK, hosted the October event for current members and new prospects interested in seeing the new jet, up close and personal. Oriens was represented by Craig Lammiman, Sales Director. Jetfly is looking forward to accepting its second PC-24 this month. It takes one more next June and another in December. “The eight-seater PC-24 is a real game-changer, capable of landing on smaller airstrips, including grass, that other comparable light jets cannot. The PC-24 gives our members a competitive advantage and such is the demand for Pilatus’ new jet, with its increased range, speed and large cargo door, just like the best-selling PC-12 turboprop, we have already filled up the flying slots for most of 2019,” Lescop added. “London Biggin Hill Airport is regularly requested by our PC-12 membership, owing to its good proximity to central London; generous opening hours and attractive facilities. We expect our new jets will be regular visitors at this popular London airport too,” he said. Cyprus | August 13, 2018–Hermes Airports welcomes LEVEL to Cyprus, part of the established IAG (International Airlines Group) and one of the world’s largest airlines family. LEVEL is a new low-cost airline, that commenced operations in June 2017. The new airline inaugurates its presence in Cyprus by introducing the route Vienna-Larnaka. In a statement, Ms Maria Kouroupi, Senior Manager Aviation Development, Marketing and Communication, said that «we are delighted to welcome LEVEL to Larnaka airport. Our flight schedule is continuously enriched as a result of our aviation development strategy to expand our network, both in regard to its routes frequency and destinations. The selection of Cyprus by LEVEL reconfirms the confidence vote that Cyprus enjoys by many airlines and tour operators, especially during the last few years. We are confident that the Cypriot travelling public will embrace this great opportunity offered by LEVEL and use this connection with Vienna and schedule memorable trips to one of the most popular and exiting tourist destinations of Europe». The flights by LEVEL started on August 11th, 2018 and will be operated with an Airbus A321 three times weekly. More precisely, the airline will conduct flights every Tuesday, Thursday and Saturday. Moscow | August 3, 2018–Moscow Domodedovo Airport (DME) and technology provider SITA today summed up the success of new automated gates which were introduced for passengers in time for the 2018 World Cup. In just over a month around the championship, more than 1.2 million passengers took advantage of the new technology to speed their way through the airport. In total,since the beginning of the year, 3.3 million people have used SITA’s Airport Self-Service Gates at Domodedovo. Domodedovo was the first airport in Russia to introduce SITA’s sophisticated passenger flow management which uses smart validation and the automated gates for secure access control. Theyallow passengers to independently pass the security controls at the entrance to the departure zone,or to board the aircraft, by simply scanning their mobile or paper boarding pass. In total, more than 150 automated gates will be installed in Terminals 1 and 2 in Domodedovo. SITA studies show that the use of its self-service gates can cut boarding times by as much as 50% reducing the risk of flight delays and improving passenger service. SITA’s automated gates and Airport iValidate technology are in use at leading airports across the world. The introduction of SITA’s automated gates and Airport iValidate technology for passengers at Domodedovo Airport was a finalist in the Moscow Urban Forum Community Awards. This is an annual award for city communities, independent projects, private initiatives and start-ups that make a significant contribution to the development of Moscow. The introduction of the airport self-service gates was among the best in the “Urban Technologies” nomination. Turkey, Istanbul | June 21, 2018– On June 21st the Turkish presidential aircraft TC-ANK carrying President Recep Tayyip Erdoğan touched down at Istanbul New Airport. It was a historic moment, marking the first ever landing by a passenger aircraft, and was greeted with a water salute on the runway. The airport is due to open on 29 October. President Erdoğan was met by ground crew and workers. “Today is a very, very meaningful day for us,” he said in a statement after the landing, being pleased about the construction of “a magnificent airport”, which will be a leading hub for global air traffic. Istanbul’s new airport will be one of the three biggest airports in the world with the annual capacity of 90 million passengers in the first phase, he said, adding the airport would be a brand for the country. Erdoğan also announced that after the launch of the new airport, Istanbul’s Atatürk Airport will be replaced by a huge park named ‘People’s Garden’. The construction of the airport, which is situated over an area of 76.5 million square meters to the north of Istanbul, in 35km distance to the city center of Istanbul, will be carried out in four phases. When all phases are completed, it is projected that the number of passengers will rise to 200 million. The airport will host nearly 100 airline companies flying to more than 300 destinations. Brussels | June 27, 2018– SITA, the air transport industry’s technology provider, today announced the launch of a major industry research project to explore the potential of blockchain. More than 100 top IT executives, attending SITA’s Customer Innovation Forum, were the first to be invited to join the Aviation Blockchain Sandbox. Seoul | May 30, 2018–Incheon International Airport has deployed SITA’s award-winning self-service bag drop technology at its new Terminal 2, effectively serving the influx of visitors to the recent Winter Olympics and in preparation for the 100 million passengers projected by 2030. Drop&Fly simplifies the bag drop process, cutting time for passengers and improving their experience. This technology also makes more efficient use of terminal capacity and ensures more accurate baggage handling. Incheon International Airport has been named the World’s Best Airport for 12 consecutive years by the Airport Council International (ACI) and Drop&Fly has been in operation at the airport’s Terminal 1 since 2016. Today, 48 Drop&Fly units (14 at T1 and 34 at T2) are available to passengers with 30 more on the way. Drop&Fly provides a safe and secure self-bag drop area. A sliding door and advanced sensors prevent tampering and the intrusion of unauthorized objects. It is fully customizable to the individual needs of the airport and is equipped with technology such as payment devices, baggage facing cameras and more. It can also provide live status and notifications on all bag drop units for ground agents, and real-time statistics to analyze trends and generate reports. Drop&Fly won the prestigious 2017 iF Design Award: Public Product, in recognition of its state-of-the-art design and intuitive user interface. Incheon International Airport had a record year in 2017, with over 60 million passengers using the airport. The introduction of Terminal 2 has increased capacity by a further 18 million passengers per year and the airport has ambitions to reach 100 million passengers by 2030. SITA is the world leader in self bag drop with more than 55 airlines connected to SITA BagDrop at more than 40 airports worldwide. Princeton, NJ | December 20, 2017– Los Angeles Airport is trialing an advanced biometric self-boarding solution by Vision-Box to clear travelers flying out of the USA in a contactless, quick and secure way. The new passenger flow solution allows travelers to board their aircraft in just a few seconds simply by looking into a high-resolution face capture system at the traveler- friendly flow-control gateway. No need to present their travel document or boarding pass anymore. The system deployed by Vision-Box captures a live, high quality image of the traveler’s unique biometric facial traits, for US Customs and Border Protection to match it against the passenger’s file containing the digital facial token captured at the initial immigration process. This process permits as well to virtualize the process of sending the boarding-pass details to the Airline Departure Control System, using face as a token to reconcile the passenger and his flight. After assuring the identity and eligibility of the passenger on that specific flight, the gateway then opens and the traveler can swiftly board the aircraft. The solution combines an effective human-factor centric design along with key security features, such as biometric data capture of superior quality in a complex environment in seconds. This combination consequently delivers high-performance reliable match against the authorities’ biometric database, pre-processed by Vision-Box anti-spoofing and liveness checks technology. In spite of the fact that the solution is ready to rely solely on biometrics, it accommodates other possible workflows that include boarding-pass scan, seat re-assignment or multiple additional verification modalities. Security, safety, efficiency, and a unique, traveler-centric experience are the cornerstone of the project developed in the scope of a partnership between LAX and Vision-Box, supported by US Customs and Border Protection Agency under the umbrella of the US Biometric Exit trial program. British Airways was the first airline to begin expediting boarding procedures using the new contactless technology. Miguel Leitmann, Chief Executive Officer and Founder at Vision-Box explained the reasons for success: “Vision-Box made use of state-of- the-art biometric technology, able to deliver high quality data that drastically enhance matching accuracy, sustained by in-house developed Deep Machine Learning engines for superior facial capture. The results present a solution that addresses current security, efficiency and flow-control challenges in a relevant, revolutionary way. We are very proud to have come up with an industry- changing solution that all stakeholders involved in the process rely on. In the end, it’s about collaboratively raising the security and efficiency standards while eliminating obstacles from the traveler’s way, offering frictionless interactions and the best experience to guests until they’re comfortably seating in the aircraft. The new contactless platform has been installed on three stands of Tom Bradley International Terminal at Los Angeles Airport and will be tested by a number of other airlines after New Year’s Eve. Kigali | November 13, 2017–Air Senegal SA has become the latest airline in Africa to introduce SITA’s passenger services system (PSS) to manage every aspect of their operation – from reservations and pricing to ticketing and departure control. The airline is one of a growing number of carriers on the continent that have turned to SITA to provide technology solutions to better manage their passenger operations. Already 15 airlines and ground handlers in Africa use SITA’s Horizon® Passenger Management and Distribution solution while 100 airlines and ground handlers around the globe have used it to board more than 123 million passengers and check in 158 million travelers each year. Horizon offers the most comprehensive, integrated range of passenger management services available today. Its infrastructure is built on a flexible platform of core systems required by every airline, allowing each carrier to customize the system to meet their specific business requirements and to accommodate future growth. Air Senegal, the west African country’s new national airline, has turned to SITA to provide a full suite of services – including reservations, ticketing, airfare distribution and departure control – that will support the launch of the airline’s first flights later this year. Istanbul | November 1, 2018–Istanbul New Airport, one of the world’s most ambitious airport projects, has appointed global IT provider SITA to bring the region’s most advanced airport to life. SITA will deliver a wide range of airport, passenger and baggage processing solutions to deliver a world-class experience, showcasing the future of air travel. Euro Air Transport IT Summit, Hamburg | October 17, 2017–Airport operator Fraport has significantly speeded up the repatriation of delayed or mishandled bags to passengers at Frankfurt Airport, with the introduction of SITA’s WorldTracer® Tablet. WorldTracer® Tablet’s intuitive interface runs on top of the WorldTracer® Management Module. The service uses standard iPad tablets, which are connected to handheld scanners and Bluetooth printers for faster passenger processing. Johannesburg | October 16, 2017– SITA is providing its world-class passenger and baggage processing technology as well as its airport management solutions to Ghana’s new Terminal 3 at Kotoka International Airport in Accra, helping cement the airport’s position as a vital regional hub. The partnership will profile Aruba Airport as an airport that drives change with passenger centric focus, creating value for their stakeholders and an excellent passenger experience. Furthermore, the partnership should provide skills development for Aruban and international students through the Vision-Box Centre of Excellence, while building a strong foundation for sustainable airport solutions. Miguel Leitmann, Vision-Box™ CEO highlights that “This is indeed a great partnership. Aruba airport has already embraced the new era of the digital airport concept and it will soon benefit further from our game-changing technology for the Gateway 2030 project. We are convinced that this partnership will be the ground base for the next generation of Happy Flow, reaffirming Aruba Airport as an innovation center for passenger facilitation and projecting Aruba with a highly recognizable worldwide airport”. Both partners are committed to invest in evolving the Aruba Happy Flow platform. New functional solutions will be (co-)created and assessed at Aruba Airport. Aruba Airport and Vision-Box share the vision that the design of the Gateway 2030 project, should fully harvest the benefits of the Aruba Happy Flow platform as a terminal-wide solution. The Centre of Excellence (CoE) at Aruba Airport is designed to combine the strength of Aruba Airport as a facilitator for innovation with the strength of Vision-Box as a technology innovator. Aruba Airport and Vision-Box will realize a high quality and continuous showcase for the Happy Flow solution. Aruba Happy Flow is the result of a cooperative consortium composed of the governments of Aruba and the Netherlands, Schiphol Group, KLM, Aruba Airport Authority and Vision-Box. Victoria | July 12, 2017– Air Seychelles, the national airline of the Republic of Seychelles, will be introducing SITA’s state-of-the-art common-use passenger processing systems (CUPPS) at Seychelles International Airport from today. This investment provides greater flexibility for international airlines operating from the airport by allowing them to share common-use terminal equipment for check-in and boarding. The airline – which provides ground-handling services to airlines operating from Seychelles International Airport – is currently upgrading its technology to ensure a smooth travel experience every step of the way. The upgrade is being performed in partnership with the Seychelles Civil Aviation Authority and SITA, a global technology provider to the air transport industry. The new systems will optimize the use of terminal facilities, speed up the flow of passengers and improve service levels for all international travelers flying from Seychelles International Airport. Roy Kinnear, Chief Executive Officer of Air Seychelles, said: “The new common-use terminal equipment will enable Air Seychelles to connect to various Departure Control Systems used by other airlines operating to Seychelles, providing more flexibility to our ground handling operations. Lisbon | June 1, 2017– The Indonesian Direktorat Jenderal Imigrasi PT Jaya Teknik Indonesia and its partner, Vision-Box, the worldwide leader in Passenger Experience and Automated Border Control solutions, inaugurated an advanced biometric Automated Border Control infrastructure system at Soerkarno-Hatta International Airport’s (CGK) brand-new terminal 3. The Vision-Box state-of-the-art biometric border control solution consists of 32 vb i- matchTM Automated Border Control eGates for eligible Indonesian nationals self- service border clearance and 10 vb e-passTM portable biometric suitcases for enhanced mobility in passenger clearance. Additionally, it includes 32 individual fingerprint and passport scanners to expedite the processing of foreign travelers at manual counters. The integrated Automated Border Control solution provides higher accuracy in passenger identity verification at the border, while increasing airport security and passenger processing capacity. The ABC solution provides CGK and the Direktorat Jenderal Imigrasi a modern technology cornerstone for its new terminal to quickly and accurately process arriving and departing passengers while enhancing airport security. Together, these cutting- edge authentication and verification systems represent the first major deployment of Automated Border Control eGates in the country. It is also the first-of-its-kind mobile border control system for immigration officers to efficiently process passengers, taking advantage of a quick and secure user-centric system. Brussels, 2017 Air Transport IT Summit | May 24, 2017– SITA has launched the first payment solution which addresses the need for airlines to be able to accept payments securely at airports when using a shared IT infrastructure. SITA AirportConnect Common Use Payment Service enables payment transactions by multiple airlines on a single payment terminal. Importantly, this is possible with any, and all, of the departure control systems the airlines choose to use. Airbus and Boeing are going head-to-head for the lead into the MoM market and the airlines are looking for a midsize plane that costs less and will seat somewhere between 225 and 270 passengers, and fly nearly 5000 miles, in roughly 9 hours. Imagine a chart where the vertical axis represents the number of passengers/payload while the horizontal axis represents nautical miles/range. Before getting into the plane action, lets review the Middle of the Market we keep referring to (MoM) – and here is the view from the folks at Boeing. Picture the middle market as a big oval that covers passenger capacity/load of 175 to 375 passengers and a range of approximately 3,000 to 6,000 nautical miles. However, this market is so large that it also includes jetliners at both the smaller end and larger end of the scale. The oval pictured in the link above represents the “new midsize airplane sweet spot”, which is more like 200 to 275 travelers in a two class configuration, with a reduced range of 3,500 to 5,500 nautical miles. 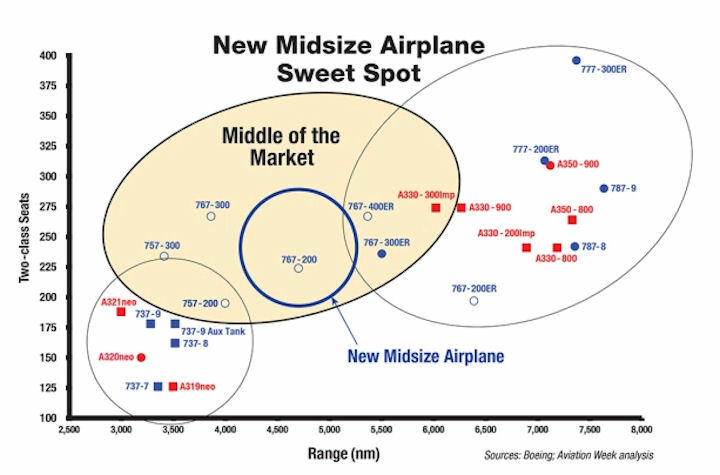 Interestingly, the only current plane that is in this newly identified midsize market circle is the twin-aisle B767-200, which hits the oval target just about dead center! Boeing is developing a business case and solution for the MoM demand and their answer is a new development that some call the B797X. The real issue is twin aisle versus single. 1 Class Seating Config. – 150 Pax. 2 Class Seating Config. – 138 Pax. Max. Seating Config. – 172 Pax. Wingspan – 35.9 M / 117 ft. 10in. Length – 35.6 M / 116 ft. 8 in. Height – 12.3 M / 40 ft. 4in. 1 Class Seating Config. – 174 Pax. 2 Class Seating Config. – 162 Pax. Max. Seating Config. – 200 Pax. Wingspan – 39.5 M / 117 ft. 10 in. Length – 39.5 M / 129.8 ft.
1 Class Seating Config. – 204 Pax. 2 Class Seating Config. – 178 Pax. Max. Seating Config. – 220 Pax. Length – 42.2 M / 138.4 ft.
As we noted earlier, the “new midsize market” is a smaller circle on the pax/range chart and the existing single aisle aircraft are right on the edge. Some experts are noting that the “new” midsize market concept could be difficult for Boeing because of existing B737 landing gear length limit problems coupled with the desired take-off rotation increase due to a longer single-aisle body – not to mention the new wing length needed for more load lift and potential composite additions to reduce load weight. While looking at an estimated 2025 entry, Boeing has some time to make the decision, but they will have to consider other aspects such as aircraft model growth, fuel burn, and competition. Furthermore, we understand that over 60% of the operators want a twin-aisle wide body versus a single-aisle narrow body, with seating expectations covering 150 to 249 pax – but the jury is still out on models and respective seat numbers. If you remember the B757 (single-aisle) and the B767 (twin-aisle) were designed to cover a larger flight range and passenger payload solutions at each end of the payload vs. range spectrum. We now have the requirement that Boeing focus on the center and build one plane (with derivatives) to solve the “market gap” problem and that will probably include more passenger comfort and expanded IFEC capability. IFExpress is betting on a twin! Further, the Boeing 797X will likely cover the 220-260 seat capacity with a designed range of some 4,500-5,000 nautical miles. But the big deal for Boeing would be the possible $150B in potential revenue! Rockwell Collins will now bring high speed, secure worldwide KA-band connectivity to government aviation customers by expanding its Value Added Reseller (VAR) arrangement for Inmarsat’s Global Xpress (GX) service. Rockwell Collins has already been providing GX and JX services to commercial and business aviation customers through previous VAR agreements. Meet Kate! SITA Lab, which explores the future of technology in air travel, has unveiled KATE, an intelligent check-in kiosk that will autonomously move to busy or congested areas in the airport as needed, promising to relegate check-in queues to the past. Using various data sources – including flight and passenger flow information – KATE can identify where additional check-in kiosks are required to reduce passenger queue times at check-in. KATE uses existing SITA data systems such as Day of Operations Business Intelligence and FlightInfo API. Multiple robotic kiosks can be automatically or manually deployed simultaneously and in formation to assist passengers, providing airports and airlines greater flexibility in managing peaks in passenger flow. The kiosks can also communicate through a Cloud service to ensure that the right number of kiosks are at the right position when needed, making them highly responsive to changes in the airport. A design patent application for the kiosks is currently underway. SITA’s cutting-edge robotic kiosk makes use of geo-location technology to find its way through the airport. KATE will use Wi-Fi to connect to vital airline and airport systems, dispensing with the need for cabling or other fixed attachments. 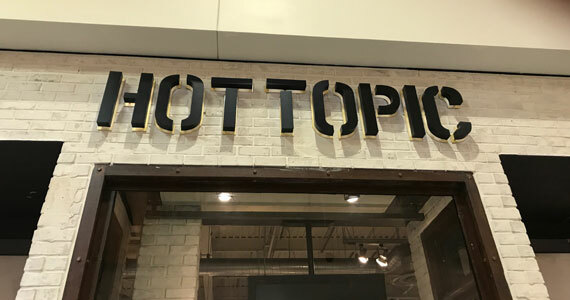 This allows the kiosk to move around freely across the airport terminal, using obstacle avoidance technology to avoid bumping into people or things. One of the key benefits of SITA’s autonomous kiosk is that it can be deployed anywhere inside the airport as well as other offsite locations such as train stations. This is particularly relevant during periods of disruption – such as weather delays or flight cancellations – where additional kiosks can be moved from landside to airside to check-in large numbers of rebooked passengers. KATE provides passengers access to her easy-to-use interface to check-in and print bag tags. AIRBORNE WIRELESS NETWORK, CA was granted experimental operating from FCC to launch ground/flight testing (using two Boeing aircraft) of its demonstration system as part of development of Infinitus Super Highway air-to-air communication system. Further they have been granted a certificate by the FCC that will allow it to conduct ground and flight tests of their demonstration system of the Infinitus Super Highway, a high-speed broadband network that will link commercial aircraft in flight. Boeing All-Electric Satellite for SES Will Help Improve In-Flight Connectivity and Enable Other Traffic-Intensive Data Applications. Built for SES of Luxembourg, the 702 satellite is Boeing’s fifth with all-electric propulsion; design includes metallic 3-D printed parts. The satellite will bolster connectivity for Wi-Fi and entertainment services on flights over North America, Mexico and Central America. It will also serve the government, enterprise and maritime sectors. This 702-model satellite also demonstrates that using 3-D printed parts can improve affordability and production. More than 50 such metallic parts are on the vehicle in the primary structure. The U.S. Federal Aviation Administration’s (FAA’s) safety efforts will also benefit from the satellite as SES-15 carries a Wide-Area Augmentation System (WAAS) hosted payload for the FAA. Global broadband connectivity provider Gogo Business Aviation is announcing that German aircraft manager and charter operator K5-Aviation is its first 2Ku business aviation customer in Europe. 2Ku is a unique, dual-antenna system developed by Gogo to bring global streaming-capable internet connectivity to large aircraft. The technology benefits from global coverage and the redundancy of more than 180 satellites in the Ku-band. Also today, Gogo is unveiling a new suite of smart cabin systems – SCS Elite and SCS Media. Both are highly integrated cabin in-flight entertainment and voice solutions that can be personalized to fit the specific needs of passengers on a given flight. Also, If you are interested in who the travelers of tomorrow are, why their inflight preferences matter, why being mobile is so important to future travelers, expectations around future connectivity, and what role personal devices play in flight – check this download out from Gogo: Global Traveler | Gogo . We should also note that Gogo has been chosen by Airbus as a lead supplier for its High Bandwidth Connectivity (HBC) program. Being part of Airbus’ HBC program means airlines can place future aircraft orders with Airbus and have Gogo’s 2Ku technology installed at the factory on all major fleet types. Those aircraft are then delivered with the technology already installed and ready for service on day one. We wonder what Boeing is gonna do? San Jose | May 3, 2017– Juan Santamaria International Airport (IATA: SJO), Costa Rica’s busiest airport, has selected SITA, the global IT provider to the air transport industry, to implement its ground-breaking control center technology solution. SITA ControlBridge will provide AERIS Holdings, the airport operator, with a centralized and integrated view of everything happening at the airport, from security to boarding gates, and from ground handling to facilities management. Importantly, it enables airport collaborative decision making (A-CDM) with all stakeholders. SJO is one of the top airports in Central and Latin America and AERIS has an intensive investment program to deliver innovation and technology to strengthen its position. SITA ControlBridge plays an integral role in providing the technologythat enables the airport to coordinate, monitor and control all airport operations centrally and break down silos among the various departments and stakeholders operating at the airport. As part of the project, SITA will also update the airport’s CCTV infrastructure and integrate it into the control center, along with radio communications. SITA’s dedicated delivery team will procure, install, configure, and test the ControlBridge components before it goes live in October. SITA’s ControlBridge solution provides fit-for-purpose airport control center technology that facilitates enhanced functionality for airports of any size and with nearly any budget. To keep both implementation and maintenance costs to a minimum SITA uses common off-the-shelf hardware where possible. Combined with SITA’s unique in-depth knowledge of integrating data from diverse sources, SITA ControlBridge is the most comprehensive and cost-effective airport integrated control center technology solution available today. Bologna, Italy | April 20, 2017– Bologna Guglielmo Marconi Airport is offering passengers new self-service convenience when checking in their baggage with the introduction of SITA’s Scan&Fly bag drop units. Passengers can now check in their own bags in less than a minute, resulting in fewer queues and a better passenger experience overall. Bologna is the first Italian airport to install SITA’s Scan&Fly units. The new bag drop units will initially be used by low-cost carrier Ryanair before being extended to other airlines. Bologna Airport is a fast-growing hub for Ryanair with more than 20 destinations and 170 flights a week. SITA is a global provider of award-winning bag drop solutions. Airlines and airports globally have welcomed the high-quality interface of Scan&Fly, the ease of its retro-fit and the ability to fully integrate with the SITA AirportConnect common-use platform. In 2016 Bologna Airport was the fastest-growing airport among Italy’s 15 busiest airports, with almost 7.7 million passengers. Over the last eight years, the airport has grown its passenger volumes twice as fast on average than Italy’s overall passenger growth. SITA has for more than a decade supported Bologna Airport with new technology. Earlier this year SITA introduced SITA’s iBorders® BorderAutomation ABCGates, providing passengers with a smooth, self-service experience through immigration. Nice, France | April 5, 2017– Nice Côte d’Azur Airport has taken another significant step towards streamlining aircraft movements across the airfield with the implementation of SITA’s Airport Management solution, providing a more predictable flow of aircraft departures and minimizing delays. By combining its market leading Pre-Departure Sequencing (PDS) module with SITA’s AirportPulse – an intuitive, intelligence portal powered by an instant-messaging platform – the airport can better manage traffic flow by allowing the various stakeholders to quickly share information and make clear decisions. This provides a common view of the airfield to all relevant stakeholders – the airport, airlines, ground handlers and air traffic control – making for more accurate planning and more efficient use of resources. The PDS departure management tool delivers planned traffic flows, reduced taxi times leading to fewer queues in front of the runways and less congestion on the apron or taxiways. It also allows the airport to improve the use of stands and gates with fewer last-minute changes. Passengers will also benefit from a reduction in delays and fewer missed connections. The implementation of SITA’s technology takes the airport closer to joining 20 of Europe’s busiest airports in achieving Airport Collaborative Decision-Making (A-CDM) certification from EUROCONTROL, aimed at improving the overall efficiency of airport operations and the predictability of events. Increased predictability has been proven to be of significant benefit to all major airports, airlines and network operations. Now, Even More Automatic-Electronic Gates at Larnaka International Airport! Larnaka International Airport, Republic of Cyprus | March 22, 2017– As part of an ongoing effort to upgrade its services, Hermes Airports announces the expansion of the auto-electronic gates system at Larnaka International Airport. Overall, seven electronic gates are now in operation, all of them located in the departures area (check-in) serving departing passengers. It should be noted that the automatic-electronic entry gates system allows the traveling public, carrying a printed copy of the airline’s boarding pass, to proceed directly to the security check and then to the retail area and departure gates of the terminal. The process of using this system is very simple and only requires the scanning of the boarding pass of each passenger. The system of automatic-electronic gates, can serve up to 1,800 passengers per hour, a fact which is expected to contribute significantly to the reduction of the total queuing time of the traveling public and the number of passengers that until recently had to be served at the Check-in points exclusively. Atlanta, Georgia | March 16, 2017– SITA, the global provider of border security and IT solutions to governments, airlines and airports, today announced the formation of the Secure Journeys Working Group to address today’s airport security threats in the USA and to work towards creating a secure and efficient passenger experience throughout the airport. The launch of the Secure Journeys initiative is in response to the current security climate and recent attacks on non-secure areas of the airport, including the Brussels airport bombing and Fort Lauderdale airport shooting. Members of the working group cite these incidents as examples that demonstrate the need to rethink the approach to getting passengers through the airport quickly and safely. Secure Journeys is an evolution and expansion of SITA’s Border Automation User Group which was formed in 2015 to facilitate implementation of the U.S. Customs and Border Protection’s (CBP) Automated Passport Control program. Addressing ways in which identity management solutions can be used along with data analytics to reduce the growing concerns around the insider threat. The value of Secure Journeys is its ability to bring together experts and representatives from across the air transport spectrum to provide input and recommendations based on their unique perspective and experience. Given the Administration’s focus on transportation security and commitment to large-scale investment for the nation’s infrastructure, the solutions and recommendations identified by Secure Journeys are vital to informing key decision makers. Seamless Gateway: What it is and why everyone will want it! Providing an on-the-move, contactless, and streamlined passenger journey, Seamless Gateway eliminates stops at airport control points and represents the next evolutionary step both in the way passengers interact with the airport and in stakeholder collaboration. Lisbon, Portugal | March 16, 2017– Advancing the concept of the non-stop and contactless airport passenger journey, Vision-Box, the worldwide leader in passenger experience and border control solutions, in collaboration with Amsterdam Airport Schiphol, is presenting its newest industry game-changer, the Seamless Gateway, during Passenger Terminal Expo taking place this week in Amsterdam. Provides travelers with a walkthrough identification experience, eliminating stops and direct interaction with officers. Identification is conducted in a few seconds, without compromising the biometric capture quality or matching accuracy of the single token. Features a full, contactless journey obtaining a facial image on the fly, while the passenger walks naturally, but without eliminating the travel document from the equation. Enables a streamlined, one-solution approach to all touchpoints, with the Seamless Gateway technology available to all travelers, adapting itself to each passenger’s unique behavior and features, and automatically activating alternative identification methods if needed. A seamless journey providing a smooth and continuously integrated passenger-centric flow, combining data from different systems to deliver the highest level of security and a modern travel experience to travelers. The powerful Common Use IoT platform, Orchestra, promotes stakeholder collaboration and activates actionable intelligence towards excellence in Airport Management. How does Seamless Gateway work? During each clearance process, a facial image of each approaching passenger is captured on-the-move, and matched against a traveler data envelope which includes the biometric and biographic details of the expected arriving passenger. As a safe and proven technology for Automated Border Control, the system employs the highest security standards and operates according to international regulations and best practices, under a rigorous Privacy-by-Design architecture. While the Seamless Gateway links the passenger with the airport, airline and border control authorities, via a simple, transparent and on-the-move interaction, the state-of- the-art Vision-Box IoT Service Platform Orchestra integrates the entire passenger identification and Common Use flow infrastructure of solutions and processes, leveraging all traveler and journey information into actionable intelligence. Orchestra unlocks a unique collaborative management ecosystem for all stakeholders, promoting synergies, maximizing advantageous interactions and offering a personalized, first-rate passenger experience within the Digital Airport Program. Adding to the outstanding experience offered by this seamless approach is Vision- Box Mobile ID technology that uses highly secure biometric tokens for seamlessly, hands-free authentication in authorized IoT devices. The Vision-Box Mobile ID can be used to digitally store multiple identification documents in a smartphone to easily and securely network to numerous services while connecting various agencies and authorities. Using a network of IoT devices, each individual transaction is stored and distributed using Trustchain, Vision-Box’s cutting-edge approach to blockchain, which allows authorized IoT devices to perform risk assessments and estimate the level of confidence in the individual’s personal identity, based on the sequence of ID verifications in the person’s IoT history. Visit Vision-Box Stand 10035 at the Amsterdam Passenger Terminal Expo for the unveiling of Seamless Gateway, the first-ever contactless face biometrics identification gateway. Distinguished guests and a large team of Vision-Box ambassadors are available for meetings and for a full, live demonstration of the new solution. Come experience this revolutionary non-stop, contactless and streamlined passenger clearance gateway and see how it will change the face of air travel as we know it!